This time I chose to do something different. Well... I decided to do each one of them different. They are each painted and/or drawn on differently to give it a unique setting. One has a cornfield in the background... one a moonshine still.... mostly mountains and hills and trees.... but then I just knew I had to do something special for Mama Fox.... and then at about 2am.... I got it.... a FOX. Well, duh! Right? 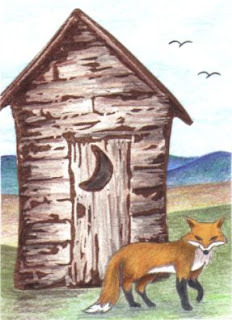 LOL So although each card is different here is "The Fox and the One Holer"